Occasionally not for profit organizations (“NPO”) are tempted with what seems like a godsend but could serve as their downfall. Not for profit organizations are often stretched for funds and seek ways to generate more revenue. Many times a potential grant will come to the NPO’s attention calling for the provision of a service not directly in the agency’s line of service but that, with minor adjustments, is within its capacity to perform. 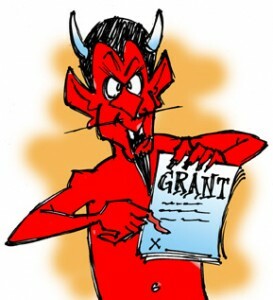 This can become a devil’s dilemma – go for the additional sorely needed funds or maintain focus. In order to obtain the grant, an often lengthy and resource-consuming grant proposal must be prepared, many times requiring outside professional assistance. If the organization succeeds, then resources have to be diverted or acquired in order to satisfy the conditions of the grant. Most agencies underestimate the additional drain on staff. They heap the responsibility onto an already overloaded staff and then wonder why the staff member either fails in all their duties or leaves in a fit of exhaustion. It’s important that the NPO understand all the costs associated with pursuing a grant, both in time and resources as well as its long term organizational impact before embarking on that path. It needs to ask itself whether it is prepared to continue to commit the additional resources to support the grant’s underlying activities even if that grant were not renewed. Too often grants that were available one year or for a short period disappear due to the grant provider’s budgetary constraints or a change in focus. If the NPO has become dependent upon the receipt of grant funds, the loss of those funds can be devastating. The gravest impact to an agency can be in obtaining a grant that takes the organization away from its focus. Agencies that enter into a series of grant-funded activities with little relationship to their core principles risk creating disillusionment and loss of enthusiasm by the staff. Most NPOs are founded and supported by volunteers and employees passionate about the core principles of the agency. Diversion from that purpose or mission with seemingly unrelated activities can undermine the cohesion and loyalty of these critical constituencies. It is just as important for NPOs to maintain their focus as it is for commercial enterprises. When everyone in the organization know and believe in its purpose, then the efforts of management, employees and volunteers can be put to their best uses. Outside experts can help ask the neutral questions to determine if pursuing the grant is both in line with the agency’s stated mission and what the impact to the organization may be in time and resources.